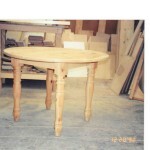 Round Pine table with turned legs. 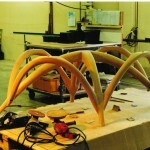 These pine legs were hand turned by a turner in SF and were one of my best selling tables. 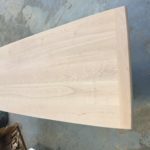 There is something about knotty pine which people really enjoy. 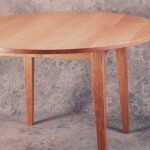 A classic Parsons table in Maple veneer. 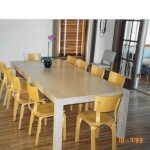 The table had to be pulled up over the second story balcony as it was too large to go up the staircase in this SF apartment. An odd piece with a solid maple top and black lacquer base with a ‘globe’ in the base. I think it was a copy of something but I can’t remember. 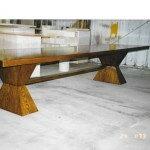 This client -designed dining table was built for a special Thanksgiving dinner and trucked to a home in Northern New Mexico. I like the base and the thick top. About 12′ x 40″. 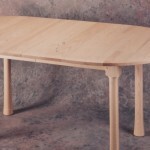 Ash extending dining table with two leaves and turned legs. 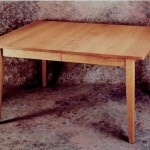 For many years I made a line of Shaker style solid wood table in a range of sizes and with or without leaves. 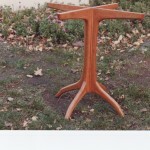 This table was a best seller and goes with a wide range of styles. 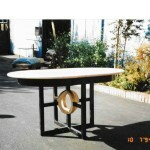 This Sam Maloof inspired base was made to hold a small oval top in a breakfast nook.